Denmark became a member of the European Union on the 1st of January 1973 and the € (EUR) was introduced in January 2002. However Denmark chose to keep the old Danish currency, which is Danish Kroner (DKR) or (DKK). 1 Dkr is equal to 100 Øre. 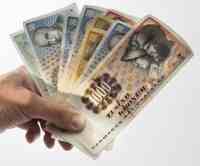 The Danish Kroner consists of following denominations. 1000 Kr, 500 Kr, 200 Kr, 100 Kr and the 50 Kr note. 20 Kr, 10 Kr, 5 Kr, 2 Kr, 1 Kr and the smallest coin 50 øre. 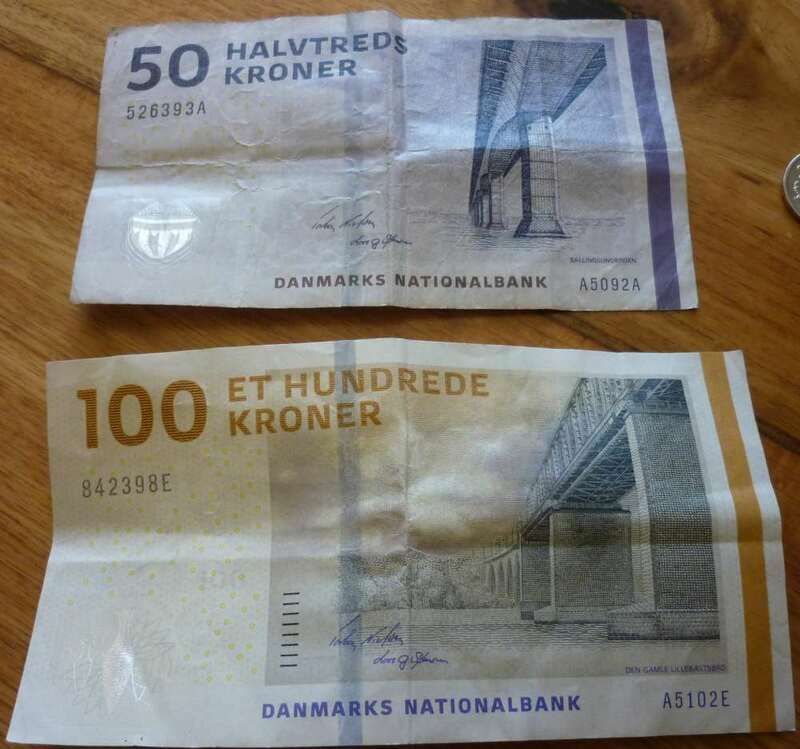 However the € (EUR) can be used as payment in nearly all shops in Denmark, especially in larger town where most businesses display prices in Danish Kr. (DKR) together with the € (EUR). Most Danes use the Danish card called DanKort, however plastic Cards like MasterCard, American Express and Visa are accepted most places and there are plenty of ATM's, and if needed the banks are willing to give you a helping hand. Most banks are closed Saturday, Sunday and on public holidays. The Danish notes and coins. For larger photo click on image. The Danish National Bank "Danmarks Nationalbank" has over the last few years changed the design of the Danish notes, the new 50 Kr. was released in August 2009 and the new 100 Kr. 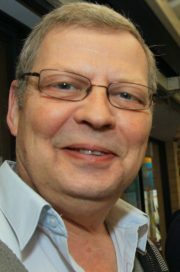 note in May 2010. The 200 Kr., 500 Kr. and 1000 Kr. note was released in 2011. The new 100 and 200 Kr. notes there are being released, are printed with "touch marks" so it will be easier for blind people to feel the difference between the two notes. 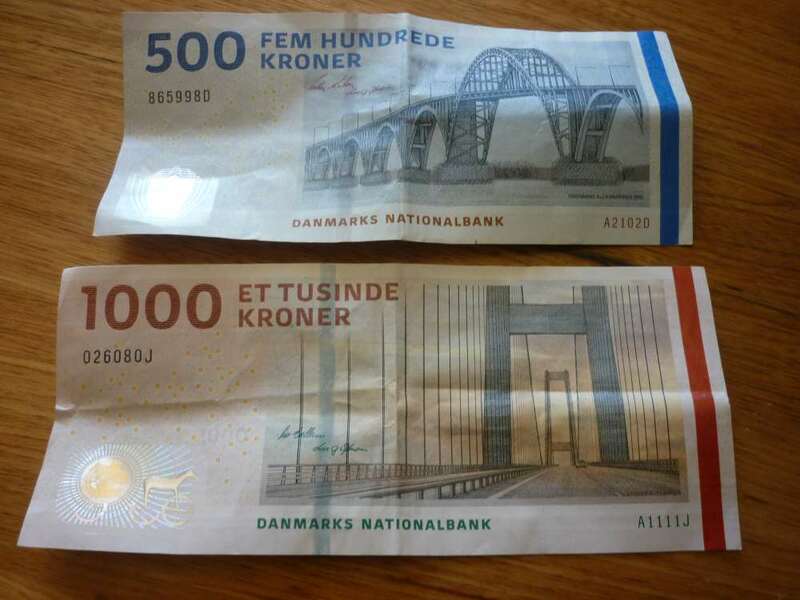 All the new Danish notes have a picture of a Danish bridge on the front. On the 50 Dkr note you will find The Salling Sund Bridge. The 100 Dkr has The Old Little Belt Bridge on the front. The 500 Dkr note have Dronning Alexandrines Bridge (Queen Alexandrines). The largest note there are in use is the 1000 Dkr note and here you will find the New Big Belt Bridge. 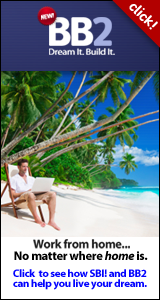 Leave Danish Currency And Go To Home Page.